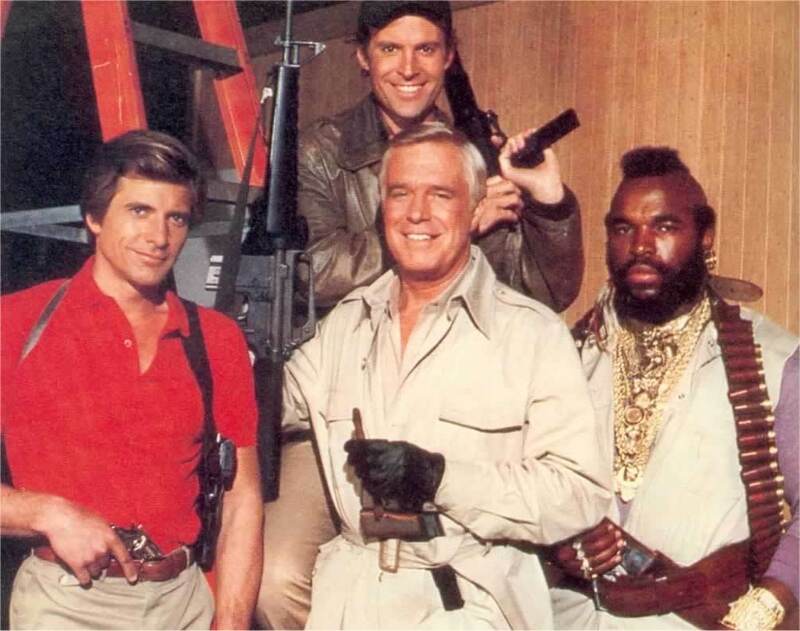 The A-Team comes to the aid of a friend in The Maltese Cow. This episode was written by Thomas E. Szollosi and Richard Christian Matheson, and had an original airdate of 3 January, 1984. With some of their earnings, Hannibal (George Peppard) has asked Face (Dirk Benedict) to invest in their friend, Sam Yeng’s (Keye Luke) restaurant, The Golden Pagoda. 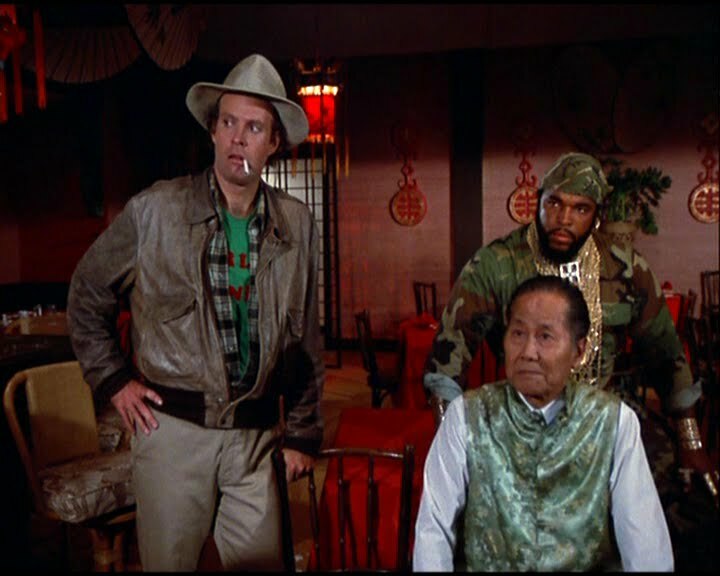 But it seems that a local Chinese Tong, led by Wan Chu (James Hong) is causing problems for the Yengs, and threatening to put them out of business once and for all. Hannibal, Face, Murdock (Dwight Schultz) and B.A. (Mr. T) all throw in to help the Yengs but may have bitten off more than they can chew this time around, and find the fists, and feet flying fast and hard in their direction. What is fun is watching Murdock channel his inner Marlowe, and is giving a constant running monologue in typical hard-boiled detective manner. It’s actually a lot of fun, and B.A. gets a bit of his own in by the end of the episode. In Plane Sight, written by Babs Greyhosky (usually a very good sign, given her track record on Rockford and Greatest American Hero) aired on 3 January, 1984 as well. This one is a bit stronger story-wise, but once again falls victim to its own formula. This episode sees the team flying off to South America, which means flying again… poor B.A., but then it allows them to feature a fun sub-plot which sees the creative mechanic being hypnotized and falling asleep when he hears the word, eclipse. The team is hired by Jess (Rod Colbin) and Carrie Hicks (Lesley Woods) to rescue a pilot, Robbie (Crofton Hardester) who has been arrested by Colonel Sanchez (Carmen Argenziano) of Venezuela for smuggling drugs. The Hicks are convinced he’s wrongly accused, and that the real drug lords behind it must be brought to justice… enter the A-Team. There are some stand-out moments in this show that I truly like, and speak to the show as well… for instance, Face is worried about the fact that they have to continually subsidize the cases they work on, consequently, they aren’t making enough, or seemingly, any money. There’s also a nice change for Murdock, who is behaving completely normal in this episode, and that alone, seems to be enough to make B.A. crazy! But best of all is some of the casting in this episode, not only do we have Argenziano, but Lance Henriksen shows up as one of the baddies!!! YESSS! It’s the moments, and the guest stars that for now, keep me coming back.